Vizcaya 89069 is a sweet ball gown with a sweetheart neckline and unique bodice. The bodice features a unique satin wrap that cinches any waist. 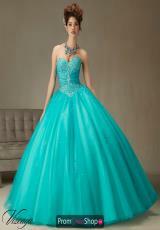 The bodice is adorned with sparkling beads and stones to match the color of the dress. Tulle skirt features scattered sequins that add sparkle to this dress. The back is straight across and features a corset lace up that ensures the perfect fit. This dress comes with a matching bolero jacket.